Located at 1224 E. Broad Street, Monumental Church was designed by Robert Mills, America’s first native born architect. 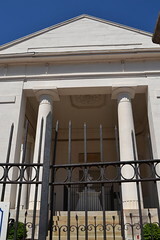 Constructed in 1814, the structure is a memorial to the 72 individuals that died in the Richmond Theater Fire of 1811. Monumental Church was placed on the National Register of Historic Places as a National Historic Landmark in 1969. It resides in Richmond’s historic Court End, slightly north of Shockoe Slip and west of Church Hill. Monumental Church is unique for many reasons. It was most notably designed during the Neoclassic period, and is one of the earliest and best examples of Greek revival architecture in the United States. Mills was the only architectural pupil of Thomas Jefferson. In his design, Mills adaptively used a Delorme dome from notes which Jefferson had taken during his tenure in France as the French Ambassador. The ashes of those who died in the Richmond Theatre Fire of 1811 are buried in a crypt beneath the floorboards of the Church. Famous parishioners included Chief Justice John Marshall and Edgar Allan Poe. Since acquiring the Landmark from the Medical College of Virginia Foundation in 1983, HRF has spent several million dollars on its restoration. The organization hopes that it will become an important gathering place for the Richmond community. Monumental Church is truly a National Treasure. Open for tours by request only.